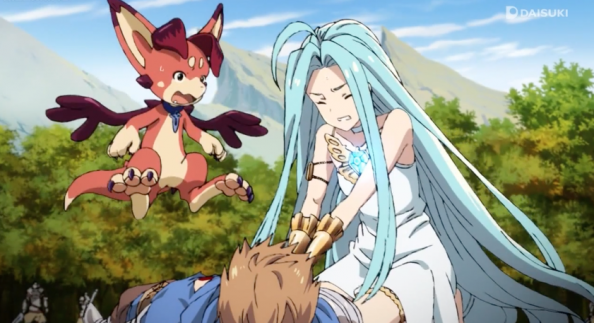 The Gist: Granblue Fantasy is the story of Lyria, a abused special magic weapon on the run from The Empire, and Gran, a friendly knight, who comes to her rescue in the woods. Gran is killed along the way and Lyria must resurrect him and unleash the power of Bowmut to defeat the evil-face villain and escape. I literally spent 40 minutes laughing with hatred at this show, which contains exactly zero drops of joy, artistic expression, nor professional craft. It may be tempting to watch Granblue to witness its profoundly generic and overwhelmingly slow structure, which are impossible to capture in stills. It may be tempting to watch if you enjoy the game, which has lovely character designs, with vivid color and shading, absolutely not captured here. Please, in the name of the 40 minutes of life I can never get back, do not. This is a profoundly terrible show. There is an unfortunate dialog convention in Fantasy RPGs, which I refer to as “Question, answer, answer repeated as question, answer.” (QAARAQA for short) It is usually reserved for the protagonist, to reinforce information that absolutely does not need to be reinforced for the viewer/player, which results in a mentally limited protagonist and disrupted narrative flow. “Who’s chasing us?” “The Empire.” “The Empire!? They’re dangerous!” “Yes. We must escape them!” “Escape them! ?” – Oh just shut up! 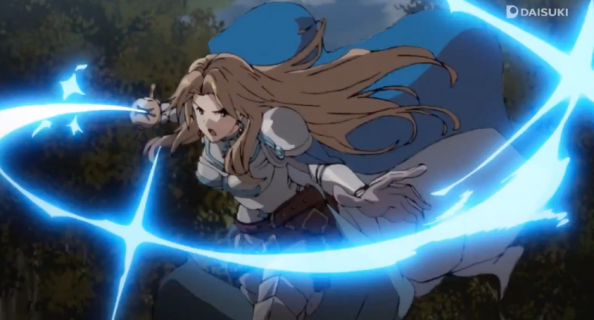 GranBlue Fantasy the Animation QAARAQAs frequently, often while characters are standing around before and after its brief action scenes. Not only does this result in a repetitive cycle that adds nothing to our understanding of the world or the characters, as they are only restating obvious plot points we’ve seen or can infer without emotional nuance, it totally derails the flow of action. Of course that would matter more if GranBlue contained action in the first place. 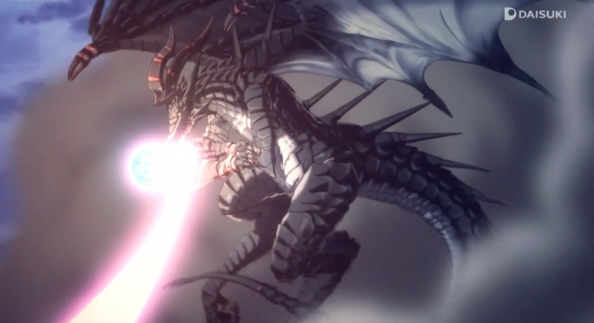 While characters do run around, occasionally launch shimmery attacks, and there are 2 CGI dragons, the animation is lethargic or lacking narrative tension or hilariously adherent to RPG battle conventions, or all three at once. In one scene, after a few seconds running away from a long conversation, Katalina stops and walks up angrily to four imperial knights harassing villagers in the forest …and swats them to the ground with her rapier. She doesn’t run, she just walks up to them and splat, they fall over, with exactly the same sword-swing and fall-down impact you would expect from a broad sword. The only thing missing was red damage point numbers appearing above the knights’ bodies. While the character design is quite detailed, that level of detail limits shading. The result looks flat, lacking volume, and the line quality, which is best described as ‘sketchy pencil’ looks sloppy, unfinished. Other visual notes like Vyrn not flapping her wings, rather bobbing up and down in the frame, and that 20 minutes of the episode are spent running aimlessly through the same muddy-colored forest, gives an overall feeling that no effort was put into the production of this show. The Verdict: Fantasy tropes aside, GranBlue‘s structure is terrible. Scenes are interminably long, often featuring characters standing around expositioning content we know or are smart enough to infer. 11 minutes in, Gran and Katalina spend 4 minutes next to a fallen tree re-explaining the current story. This is immediately after running away from a group of soldiers, without a sense that they’ve ‘gotten away’ or are hiding. They’re just here, nonchalantly talking about the plot. No tension, nothing. “Gran! Please use my power.” “Your… power?” “Yes” – ARGH! How would this compare to the currently airing Chain Chronicle anime/movie, if you’ve seen it? That one, I think has much better animation than this, but the plot assumes you’re familiar with the source game – it doesn’t give any exposition for new viewers. 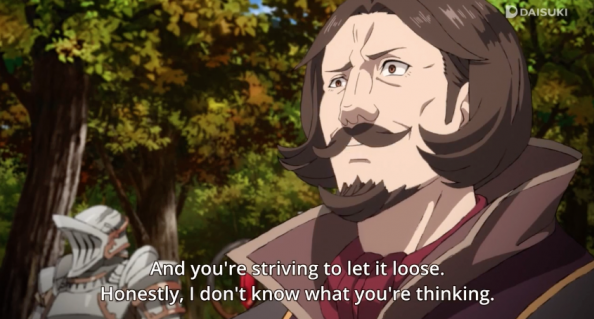 Chain Chronicle is far better, animation wise, but has similar pacing problems. I didn’t review it, in part, because it’s impossible to get into as a new viewer. The opening 15 minutes are just an endless string of character introductions that come off as a flavor from every cliche. I LIKED CC, in that the villain immediately wins and the war ends on a down note but there is no way to care about 25+ characters all thrown at you at once. I would give that one a 6 compared to this. The game is pretty fun, but the story in the game is admittedly generic. A lot of the fun comes from the various colorful and unique characters you meet in the game and the side stories said characters are involved in. There are a few moments in the main story with actual feels in them though, so points for that. The anime producer said he originally wanted to include Djeeta so there’d be 2 protags to follow, but the executives at Cygames rejected it – they want this to be about Gran. This is interesting because I’ve been tossing up whether or not to watch this but most of the other reviews I’ve read have said its okay (if a bit generic). Thanks for sharing your thoughts on it.